An agile, highly manoeuvrable and comfortable bike with a shrewd geometry. M5 Recumbents' smartly-designed shape enables very compact stems compared to other brands. Keep your elbows in a highly aerodynamic "on-board" position! Speed at 250 Watt of this machine in C-version is an incredible 48 km/h or 30 mph! M5 collected in its 30 years of innovation no less than 18 world records, which is a record in itself. Design, manufacturing and racing have always had the highest attention at M5, resulting the fastest bike but one*. In short: M5, "the Optimal Challenge!" 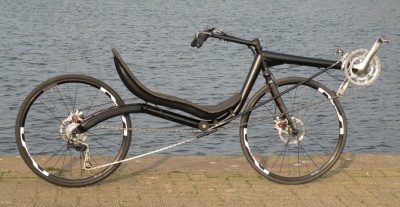 The matted black M-Racer on the picture shows more space between seat and rear wheel, due to the mounting of a smaller size seat. The standard Cr-Mo front forks have an aero shape and are specially manufactured for M5. Riders with an inner leg length of approximately 80 cm/31,5 inch can already use a 26 inch front wheel, without the wheel being able to interfere with the cranks. With the use of a 28" front wheel this will be approximately 85 cm/33,5 inch. The "dormant blue" M-Racer on the picture has wheel sizes 26/28 inch (ETRTO 571/622). The weight with a carbon front fork and seat is limited to 12,4 kg. The standard version will be 1,8 kg extra. Long cables run through the main frame through thin walled tubes. Chain guider bolt is concealed in the frame. The compact stainless steel flexpipers at the handle bar are, of course, standard features. *) In case you're wondering: that would be the M5 Carbon High Racer! Options lightweight aluminium carrier (600 grams) with closed surface and integrated LED, high aero rims, etc.